My previous post shared my feelings of how successful I thought the Olympics have been from a fan's perspective. 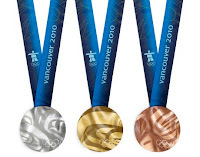 The 2010 Winter Olympic games from Vancouver has been a tremendous success. If you have ever been an athlete, you will know that with many sports there are a diverse range of emotions that are experienced. Watching the Olympics and cheering for your countrymen and women, you experience a lot of these same emotions albeit on a different scale. For many in Canada, a sport like hockey is a religion. Whether you play, coach, ref or watch it, hockey is a part of most Canadians lives. To see Wayne Gretzky in the opening ceremonies carry and light the torch was pretty special. To see the passion expressed as the men's Canadian team experienced a 5-3 loss to our arch rivals the United States was incredible. The 2010 Winter Olympics have had their share of ups and downs as all Olympics do, but for me these games have been the most impressive for me. To illustrate, let us share our top 10 moments of the 2010 Winter Games from Vancouver. Four days after her mother unexpectedly passed away due to a heart attack, Joannie Rochette earned Olympic bronze. Her mother Therese had arrived in Vancouver only to succumb to a heart attack upon arriving. When I first heard about this news, I felt a little numb. Strange considering the fact that I never knew the Rochette's, but as a Canadian I like many other Canadians felt the pain of Joannie and her family. A part of me thought that oh no, there's no way she can compete now. Yet true to the Canadian way, on Tuesday night, Joannie Rochette performed in one of the most amazing, inspiring and focused performances that I have ever witnessed. Finishing third after the skate with one more skate to come, Joannie lifted a nation to their feet, with tears and a sense of pride, she had the entire country's support. Yesterday night she completed the second half of her skate, securing a bronze medal in the women's figure skating program. The first time a Canadian woman has been on the medal podium in this event since 1988 in Calgary. This was a true awe-inspiring performance. I'm not sure who they were thinking will be Canadian flag bearer at the closing ceremonies, but I know who my choice would be. Congratulations Joannie, you are a hero to many Canadians and Olympians. Well done. Death on Day One - I was working from home with the TV on in the background when TSN went to a sports break and showed footage, the one and only time they showed the footage, of Nodar Kumaritashviliv, the 21-year-old Georgian luger who died from a crash during a training run. The young athlete was thrown through the air at speeds of nearly 150 km/hr striking his head and body on a girder beside the track. I'm not sure if I have ever seen a more disturbing piece of footage. My thoughts and prayers go out to the family of Nodar Kumaritashviliv who was taken from them too young. Opening Ceremonies of the 2010 Vancouver Games - very impressive to say the least. Loved the show which at times seemed like a major Cirque de Soleil production. My favorite was the whales swimming through the floor of the stadium. Coupled with a haunting performance from KD Lang, mastering Leonard Cohen's "Hallelulliah". Then to see Canadian royalty from Bobby Orr, Anne Murray, Donald Sutherland, Betty Fox; mother of Canadian hero Terry Fox, and other Canadian legends march out with Wayne Gretzky carrying the torch and lighting the Olympic cauldron. Pretty cool even with some of the technical glitches. Reports suggest the opening ceremonies cost $30-40 million. Some will say it wasn't worth it, but at the end of the day Canada put on a great show. The list of flag bearers can be found here. Canada's first gold medal on home soil - With this being the third time (Montreal 1976, Calgary 1988) that Canada has hosted the Olympics, Canadian athletes had never won a gold medal on Canadian soil. Well the inevitable happened as Alex Bilodeau won gold in Men's Moguls on Day Two of the games. When all is said and done Canadian athletes may be taking home closer to a dozen gold medals from the 2010 Olympic Winter Games in Vancouver. Jon Montgomery from Russell Manitoba winning Gold in the Men's Skeleton - with a US-like celebration Jon Montgomery is Olympic champion in Men's Skeleton. With a Canadian flag draped over his back as he ran through the streets celebrating, someone passes Jon a jug of beer and in true Canadian fashion he proceeds to drink it and drink it. Classic moment. Closing Ceremonies - they haven't even happened yet at the time of this writing, but we expect big things. Reports suggest that part of the performance will be Alberta-bred band Nickelback rocking out. Canadian Women Bobsled Dominance - Bobsleigh dominance. a gold and silver medal in the same event. 'Nuff Said. The bobsleigh gold medal won Wednesday night by Kaillie Humphries and Heather Moyse alongside Helen Upperton and Shelley-Ann Brown who took home the silver medal. Canada' Curling Mastery - both, Canada's men's and women's curling teams played exceptional on their way to Gold medal matchups. On the men's side, Canadian skip, Kevin Martin made some remarkable shots during the tournament resulting in a gold medal performance. Cheryl Bernard was in search of Canada's first gold medal in women's curling since 1998. A great round robin performance with the Canadian rink finishing first culminated in a gold medal matchup vs. the defending world champs from Sweden. One shot away from Gold, but the ladies fell short earning the silver medal. Still an excellent performance. Congratulations to both teams. Canada's Hockey Dominance - well the Canadian women did it again winning their third gold medal out of the past four Winter Olympics. Similar to the 2002 games in Salt Lake where both the men's and women's team claimed gold, Canada has shown who the true superpower in hockey really is. On the men's side strong another strong performance by Jarome Iginla of the Calgary Flames, arguably the best player on the team for the duration of the tournament. Iginila, not Crosby was the star of this team with young Drew Doughty also coming into his own. Could the US be spoilers for millions of Canadians? I say thee nay. Quite possibly the most important hockey game in Canada's history. A win would mean that Canada sets the record for most gold medals at a single Olympics. Nobody has ever won 14 gold medals at an Olympic games. Canada to own the podium? They definitely own the top step of it, that is for sure. Congratulations to all athletes. Finland women's hockey team winning bronze - a bit of a surprise here, as the Finns played well enough to earn a bronze medal and were in good spirits as they received their medals with some of them writing "Thanks Vancouver" on the palm of their hands. The men's team also won bronze in hockey after an amazing game with Slovakia.